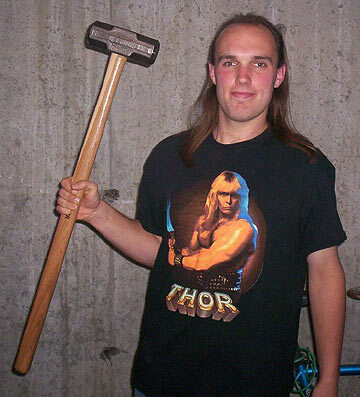 Photos of THOR's fans - sent in to show their support for the ThunderGod! we can add them to the Fans With THOR photo section. Contact us to submit your photo today! 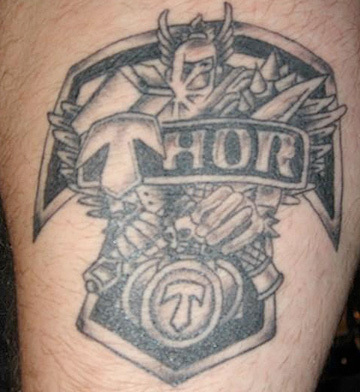 Mask version of the THOR shield logo on the arm of a THOR fan in Germany named Didi. THOR shield logo on the arm of a THOR fan in Massachusetts who goes by the name of Wolfheart. Original logo art by Page Wood 1985 & updated by Michael Pilmer in the 1990's. 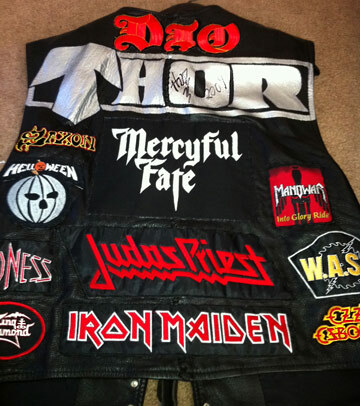 Autographed THOR backpatch - made by Duane in San Francisco...and signed by THOR in 2009. 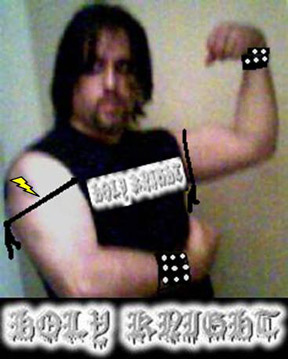 Stephen, aka "Rock", of the band Holy Knight is a THOR fan and proud of it. Franco Medici from Buenos Aires, Argentina...with his THOR totems! HAIL THOR! 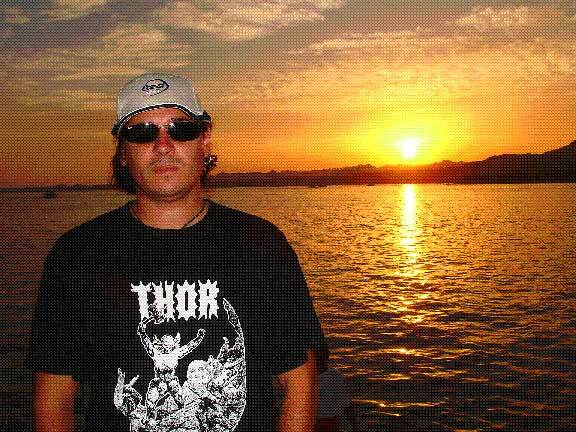 Slodovan Minotauro from Barcelona, seen here posing near the Red Sea in Egypt - Oct. '05. 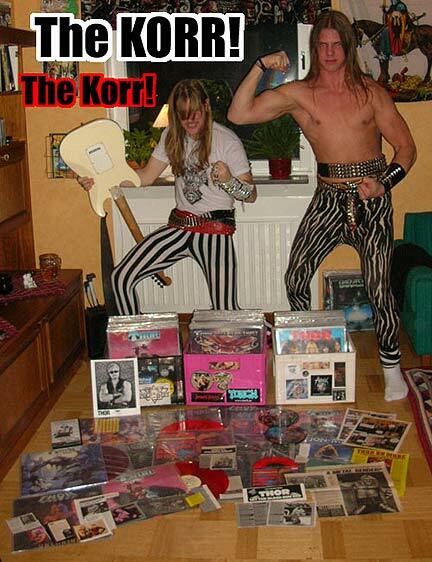 Swedish THOR fans: Oscar "Thunder" Rolfsson and Fabian "Lightning" Puregger shown here striking a thunderous pose with Oscar's massive THOR collection. 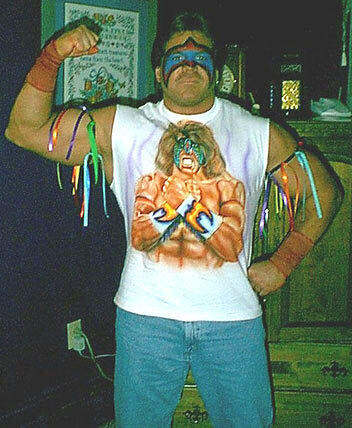 Beky Hayes from Austin, TX. 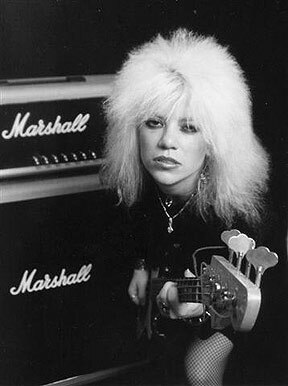 Photo circa 1986. 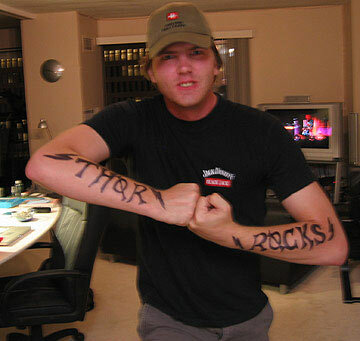 Ricky, who saw THOR live in 2005, seen here with his permanent marker tattoo tribute to THOR. 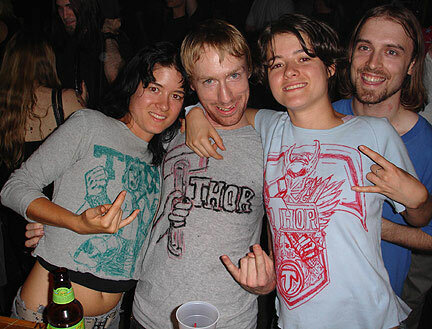 Seen here with their custom-made THOR T-shirts. Strike First Music crew repping THOR...NYC Style! Motala Metal Fest in Sweden in 2001 or 2002. All Hail Swedish THOR fans! with Maria (keyboard player of the Polish cult band CETI). 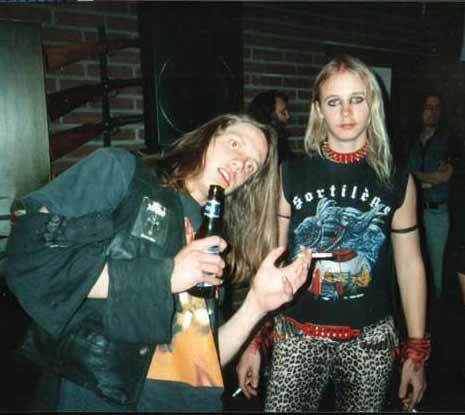 Photo taken at a RockMetal fest in early 2003. Here's a picture of a group of Swedish Thor fans at Rockslaget 2003 in Karlshamn! From the left: Joanna, Cido, Evy, Rob, Helena, Hofer, Oscar, Tomas, Peter and Lindell. Thanks to Oscar Rolfsson for sending this photo.